“Leaving Koh Lanta.” flickr photo by ironypoisoning. Koh Lanta is part of the Mu Ko Lanta National Park. It was first established as a marine park in 1990. It consists of several islands Koh Lanta Noi and Koh Lanta Yai being the largest. It’s a mere 3 hour ferry ride from Koh Lipe island. Koh Lanta is known for being laid back and peaceful. It’s a large island; some 27 km long and 6 km wide, and is ideal for exploring on a motorbike. There are a large number of quiet beaches dotted around the island, also there are impressive viewpoints, treks and caves to explore. 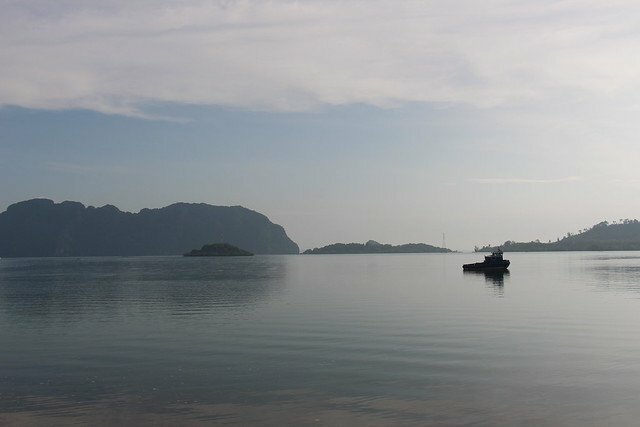 Ferries arrive at Ban Saladan pier in the north of the island. The Koh Lanta to koh Lipe ferries operate during the high season only. Until the 30th of April 2019 each day there are number of operators; (Tigerlinetravel, Lomprayah, Saturn Pak Bara Speed boat club, Jolly Travel and Bundhaya Speed boat) that ferry passengers between the 2 islands. After the 30th only Tigerline operate until the 15th of May. After that there is no service between the 2 islands until later in the year. Usually late October – November. You can check times and purchase tickets here. Ferries depart Koh Lanta at 10.30 am from Ban Saladan pier and arrive at Koh Lipe at 13.30 pm and it takes approximately 3 hours depending on the weather. Ferries depart Koh Lipe at 9.00 am and arrive at Koh Lanta at Ban Saladan pier 12.00 pm and again it takes approximately 3 hours depending on the weather. Be sure to follow your operators rules and check in on time. Usually 30 minutes before departure. If you wish to travel between Koh Lanta and Koh Lipe or vice versa during the low season you will need to travel overland and then catch the ferry operating between Pak Bara and Koh Lipe. Travelling between the 2 overland takes approximately 6 hours and 30 minutes. It’s worth noting that this option is also available during the high season and it’s also cheaper coming in at around 1000 baht. So if you don’t like long boat trips you may want to consider this option. Once again for low season transfers you can search here for tickets. Prices between the companies were roughly the same at the time of writing however some were offering promotional and these deals may end soon. The lowest available was 1500 baht on a promo and the highest was 1900 baht. Children’s prices were between 1000-1100 baht. Many of the companies do not specify the age group for when children are classified as adults. Infants It’s worth also noting that at the time of writing Satun Pak Bara speed boat club were offering free travel for infants up to 3 years of age. Presumably if they share a seat with an adult. The above information is a guideline only. Time and prices are subject to change. Weather can change quickly and crossings may be cancelled.